The latest in the BB’s life is firstly the fitting of a 5 speed Nissan Bluebird gearbox. This was brought about because my original 4 speed 3 synchro box was, to be kind, dicky. It sometimes actually went into second, but didn’t necessarily stay there, and so on. I was offered and considered a swap to a 4 synchro box, but the modifications required were greater than the mods for the Nissan box. Anyway, I basically followed Eric Banks’ article, and learned some things not mentioned. I have annotated Eric’s article and submitted it to David Hoskins, who will include it in the next edition of the G-Torque Archives magazine. In the meantime, anyone who is contemplating this swap, can contact me and I will forward a copy of it. My opinion, and that of others that have driven my B, is that it is a totally different, and better, car, to drive. A rough estimate of cost is about $850. 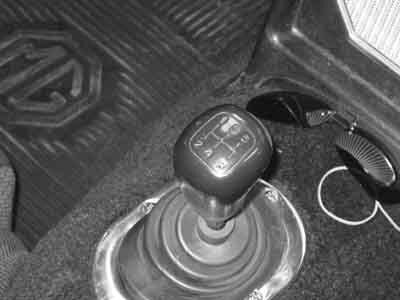 5 speed knob, the only visible sign. Some incidental advantages, other than headrests, are more supportive seats, speakers in the headrests, which enables one to actually hear the radio, when travelling and adjustable backrest angle. Things I did that aren’t mentioned in the article, are to place 10mm plywood spacers under the rails, as the original seats had. However, this made the driver’s seat too high, cutting out vision due to the windscreen top. So, on the driver’s side, I tapered the spacer to zero at the back, and also removed the pressed boss in the rails, lowering it by approximately 15mm. 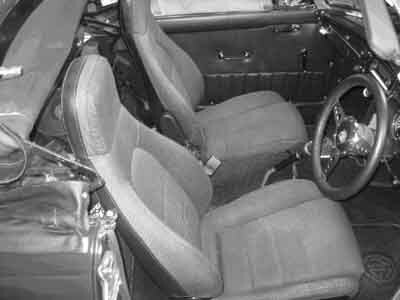 Note that the driver’s and passenger’s seats need to be swapped, to allow room for the tilt mechanism.